Sandy Carter, aka SocialBusinessSandy on her blog, is widely known in our industry as a true thought leader and pioneer in social business. Sandy is IBM’s Vice President of social business evangelism, and we are thrilled to tap into her storehouse of social business advice, IBM’s training program, and social leadership knowledge. How are IBM’s channel partner social media training initiatives going so far? The program is doing well, we’re reaching organizations across the globe, educating them on social. In fact, we’ve expanded on the initiative to include a social business solution authorization program for solution providers under which channel partners can earn higher margins and other benefits when selling IBM social networking products. Through the social business solution authorization we provide training and technical certification for channel partners working with IBM Connections, our industry leading social software platform, and other related products. The program also includes training that helps partners work with their customers to develop a social business agenda, a vital first step to a successful social business transformation. Based on IBM’s Midmarket report, ‘culture’ was reported on as one obstruction for executives to overcome with social business. How has IBM’s training helped in this regard so far? Culture is extremely important to a successful social business transformation, in many regards, it’s even more important than the technology you use. An organization must promote a business culture of transparency and trust from senior leadership to those working in the field. It must work to encourage a culture of sharing as well, employees need to feel comfortable sharing their sentiment and collaborating across teams and departments. With these cultural elements in order, an organization is setting itself up for a successful social business transformation. IBM is helping to train organizations to create this type of business culture every day and we’re poised to do so as we ourselves are a social business and have gone through this process. We know first hand what it takes to bring together a global organization of over 430,000 employees to share, collaborate and work more efficiently. With Dell computers recently announcing similar training initiatives, how is your program different? I’m not very familiar with Dell’s program, but we believe social training is vital for organizations looking to make the most of their social business transformation. 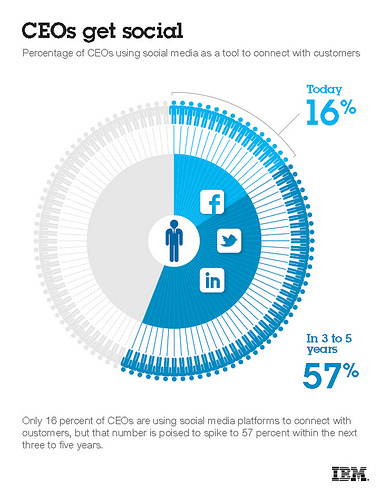 The more educated and aware organizations are on the reach and potential social can have on their business the better. With global partners, how have you addressed cross-cultural challenges in your training? IBM is lucky because we’re also a global organization, we understand the barriers to adoption due to cultural differences because we’ve faced them and that’s why we’re so well positioned to advise clients on how to best address and overcome them. “Social Leadership” is critical in adoption of social business, why do you feel this is important? IBM Connections is our industry-leading enterprise social networking platform. Powered by analytics, IBM Connections delivers the widest range of social networking capabilities, including wikis, blogs, activities, to help organizations collaborate on the fly. Connections provides users with a secure platform where they can connect with one another, business partners and customers, share, collaborate, find expertise and more thus increasing efficiency, enhancing decision making, creating true team collaboration, and providing the ability to identify (and more importantly) access skills throughout the organization. Beyond it’s social application, the real power of Connections is in its analytic capabilities. For example, organizations can integrate and analyze massive amounts of data generated from people, devices and sensors over the platform and more easily align these insights to business processes to make faster, more accurate business decisions. By gaining deeper insights in customer and market trends and employees’ sentiment, businesses can uncover critical patterns to not only react swiftly to market shifts, but predict the effect of future actions. From TD Bank, to Electrolux to Lowe’s Home Improvement stores, IBM has helped 35% of the Fortune 100 transform their businesses with the use of our social networking technology. Social business is the new way of working, integrate social into biz processes for success! If there is one thing businesses should integrate into their social business strategy, what should it be? Analytics! Don’t ignore all the important and actionable data you’re now privy to thanks to social. Use it, act on it! What is your favorite social media tool to use! Thank you Sandy, I truly enjoyed the interview, look forward to future conversations, and since SayItSocial is in the social business training space, we’ll be following you and IBM closely!